Clara F. Misner, 88, of Fostoria, passed away at 6:15 am Thursday November 22, 2018 at Independence House, Fostoria. 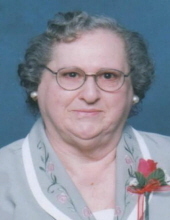 She was born August 17, 1930 in Burgoon to the late Jay and Mildred (Ridley) Miller. She married Warren L. Misner June 28, 1952 and he died in 1982. Surviving are daughters, Linda (Rick) Blackburn, Van Buren and Diane Staton, Florida; six grandchildren; and eleven great-grandchildren. She was also preceded in death by a sister, Lelah Overmyer; and brother, LeLand Miller. Clara attended Jackson Liberty School, was a homemaker and a longtime member of the Church of God. Visitation is Monday 4-6 pm November 26, 2018 at HOENING & SON FUNERAL HOME 133 W. Tiffin St., Fostoria, OH 44830. Funeral service is 10:30 am Tuesday at the funeral home, with burial following in Metzgar Cemetery, Helena. Memorials are suggested to a local humane society in Clara’s name c/o the funeral home. To send flowers or a remembrance gift to the family of Clara F. Misner, please visit our Tribute Store. "Email Address" would like to share the life celebration of Clara F. Misner. Click on the "link" to go to share a favorite memory or leave a condolence message for the family.